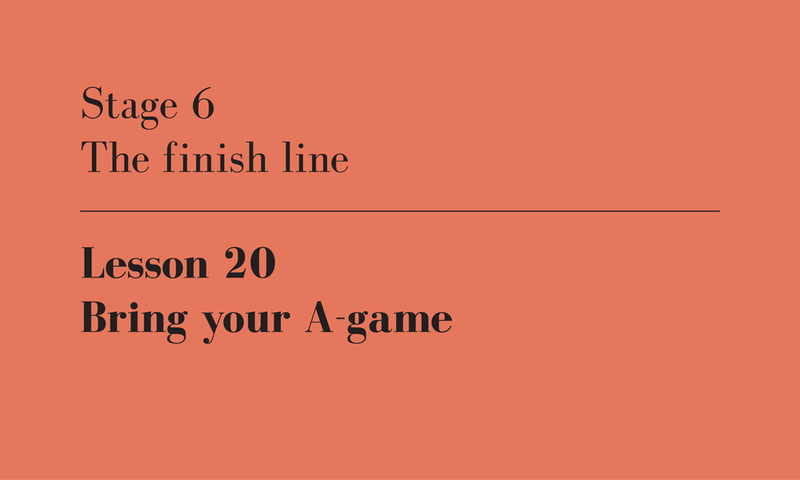 This is the 20th of twenty-one lessons for design students, gathered from the combined experience of being a student, and teaching students. I will published one lesson each weekday until they’re done. This may come as a surprise, but in design you are distinguished first by your commitment and only second by your capacity. I’ve chosen my words carefully here. I’m not saying that to produce a great project you need commitment more than you do capacity. Nor that commitment is more important than capacity. Rather, I’m saying that whether you like it or not, your design studio is a competition. You are competing with your fellow students for my time, my attention and my trust. In an ideal world, or perhaps one run by intelligent robots, I and my fifteen students arrive in class at the allotted time. I divide our three hour session into fifteen equal periods and spend exactly that time with each of you. My advice is dispassionate, objective and constructive. I am perfectly fresh and alert for the entire studio, and you each receive precisely the same input from me. It goes without saying that this is not an ideal world. I regularly run over time with some students, usually with the best and the worst of you. I must confess that I sometimes even miss out on getting to all of you, and have to make up for it the following session. I am more constructive with some students (usually the best) and more critical with others (usually the worst). I am without doubt less fresh and alert with my last student at 9pm than I am at 6pm with my first. I am merely human. Which means our teacher / student relationship is as complex and imperfect as all other relationships. Fortunately, there are ways you can manipulate me. If you produce plenty of engaging work, and respond to what I and your peers have to say about it, then you earn my time. If you are committed to the studio culture, help others and are prepared to voice an opinion, then you earn my attention. And if your design work is consistently good, evolving steadily from week to week, then you earn my trust. Basically, if you are committed to the design studio, I will be committed to you. If you can do this, then by the time you arrive at the end of semester you will have had more minutes from me, more enthusiasm, more constructive feedback and are more likely to gain the benefit of the doubt. An uncommitted student has to prove herself in her final examination, she has to fill in all the blanks to demonstrate that she’s addressed all the assessment criteria. In contrast, I fill in the blanks on the behalf of a committed student, and advocate on her behalf when a guest critic fires up. So, do good design work and don’t do it half-assed. Bring your A-game, author’s own image.